Siamese Cat Characteristics. What Makes Siamese Cats So Special? Siamese cat characteristics - what makes Siamese cats so ... extra-special? To me, all cats are special, but there are certain Siamese cat characteristics that sets this particular breed apart from the others. So what are these characteristics? Just what is it that makes Siamese just that little bit more special? First, of course, there's their coloring. All Siamese have creamy coats (warm beige or cold blue-white, depending on their point color) and darker ears, face, paws and tail – their 'points'. Their coloring is probably the most well-known of all the Siamese cat characteristics - their pointed pattern makes them extremely recognizable and unlike any other breed of cat. (See Siamese Cat Colors for more on the different point patterns). To me the most special of the Siamese cat characteristics, the ones that make them different to all other breeds, are the color and shape of their eyes. They should have almond-shaped eyes that slant gently from their noses up towards their ears. This oriental, almond-shape shows off to perfection the brilliant blue eye color, which ranges from a very light blue (in paler pointed cats) to a deep violet blue in a cat with a darker body. The gene that causes the pointed color pattern is also responsible for the color and shade of the eyes. The eyes of a seal point (the darkest point coloring) are generally a darker, deeper violet blue, while cream or lilac points (with the palest coats and points) tend to have lighter, china-blue eyes. 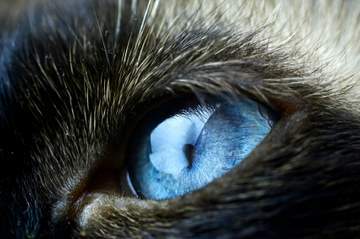 Any cat with blue eyes is likely to have some Siamese ancestry. Although many legends associate the breed with crossed eyes, a squint is in fact now regarded as a breeding fault, and penalized in show cats. Another of their defining characteristics is their voice. Siamese cats are well-known for having loud voices and on occasion they can be deafening. However, the loudest cries are generally specific to females in heat, and males in search of females. Once heard, never forgotten. Most Siamese voices, though, are perfectly acceptable in pitch, but they are different! The breed is very communicative, and most owners are able to recognize the extensive 'vocabulary' or range of sounds of their own particular cat. My cat has different 'words' (variable pitch, length of cry, different sounds and also different body language) to let me know when he's sleepy, when he wants to go out, when he's in a playful mood, and of course, when he wants to eat – a firm, definitive "MIAOWRRR!" that can't be mistaken for anything else! Some members of the breed have low, gravelly voices, others have high-pitched, clear voices, and when in full voice their cries have sometimes been compared to those of babies crying. Every Siamese has its own particular personality and most are active, energetic cats. They are intelligent and enjoy human interaction. It has been said that they can be moody but I have never found this to be so – every one that I've come across has been loving and very endearing. In general, Siamese cats are healthy cats with long lives, living in some instances for up to 20 years.